First up tonight is Fury UK. The Manchester three-piece take to the stage in front of a a medium but rapidly growing crowd as the doors havent been open for long so many fans are still queuing to get in. Still the crowd they get grows steadily through their set to be almost full capacity before they finish. Fury UK have decorated the set by draping their monitors in Black and white Union Jacks with Fury UK emblazoned on them. The bands performance is excellent - plenty of energy and enthusiasm and its clear they're enjoying themselves up there on stage rather than just playing. Their music with plenty of guitar riffs really goes down well with the crowd tonight. A great start to the night's entertainment. second. When the lights hit drummer Steve Ellet, half the audience are temporarily blinded by the reflections from his silver sequin covered shirt - still, it does make a change from most drummers who play in a T-shirt or bare chested. hunt". The crowd clearly enjoy Wolfsbane's set and its clear that they've put in a performance that Saxon will have to try and beat. Tonight though is Saxon's night, in what seems to be becoming a Saxon tradition, they're here in London on St Georges day once more. 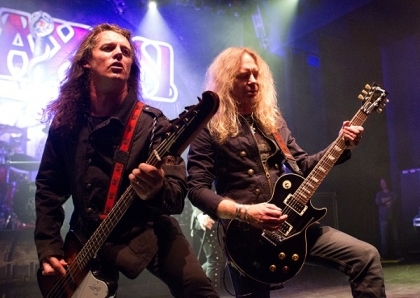 For a band with Saxon's image and pedigree it seems like the perfect date to see them play. They come out and quickly blast into a new track "Hammer of the gods" from the forthcoming album "Call to arms" which Biff tells us later in the show is due out on 23rd May. 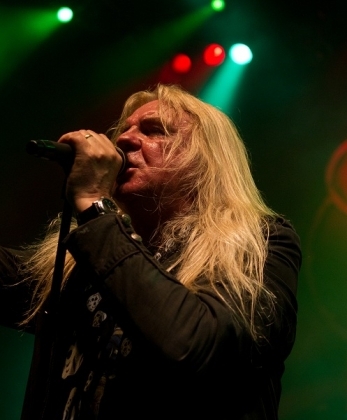 Saxon have an impressive choice of songs to pick from having released lots of great albums over their long career including many that have become true rock or metal classics. Tonight's set gives us some of these classics as well as newer material. Old or new, the fans are having a great time tonight, despite the venue being like a sauna tonight due to the heat and the fact that most of the crowd got soaked in a rainstorm shortly before coming in, so they steam gently as they dry out in the heat. Downstairs and the first two upstairs levels are packed out - Saxon have drawn a large crowd tonight. During a break in the show, Biff tells the crowd that to raise money for the victims of the earthquake in Japan they've been giving fans the chance to pay to watch soundcheck and meet the band with the cash going to charity. He tells the crowd that they've raised £2340 in this way during the tour - a great result which gets a well desrved cheer. Saxon's years of experience are clear to see as they all move around the stage, using all the space available, and swapping places so people on either side of the crowd get to see all the members (apart from the drummer obviously) up close. Its refreshing to see that Biff, rather than hogging the limelight as many front-men do, actively moves to the back of the stage at times when he feels that the guitarists should be the focus of attention. nice touch. For the finale, "Princess of the night", Biff had the crowd singing along. As the band left the stage, nobody doubted that there would be an encore, and they weren't disappointed when the band came back out and launched into "Crusader", complete with the light displays showing Crucifixes, and then ended the encore with another Saxon classic, "747 (strangers in the night)". After that it was time for the band to leave the stage again, before eventually coming back out for a second encore - "Strong arm of the law" and "Wheels of steel" - two early Saxon songs that have stood the test of time and sound as fresh as ever. Two classic saxon anthems to end a great night.